USA Today is running a front-page story on the removal of thousands of people from tribal rolls. 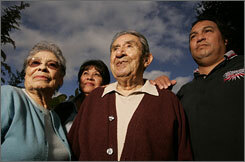 The story mainly looks at California tribes that have disenrolled about 2,000 people. The Pechanga Band of Luiseno Indians, the Picayune Rancheria of the Chukchansi Indians are among the tribes whose disenrollments are tied to gaming disputes. The Cherokee Nation of Oklahoma will vote on an initiative to deny citizenship to thousands of African descendants. The Narragansett Tribe of Rhode Island has been taking people off the rolls for the past decade. Daniel Littlefield, the director of the Sequoyah Research Center at the University of Arkansas, says money is behind the trend. But Kevin Gover, the former head of the Bureau of Indian Affairs, believes feuding families lead to disenrollments.